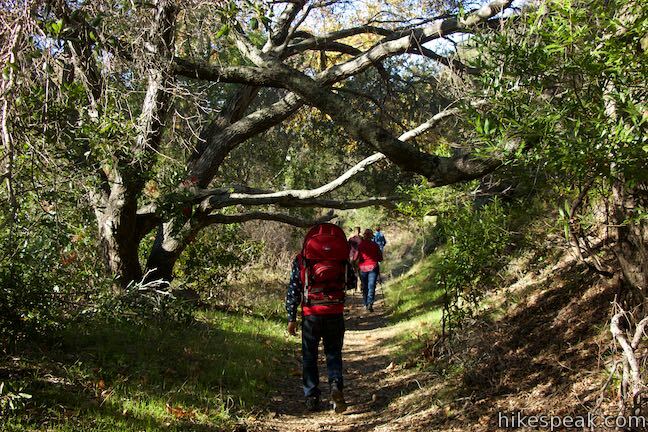 During the late teens of the 22nd century, San Luis Obispo has developed Reservoir Canyon Natural Reserve into a versatile hiking destination, with upgraded trails and features. 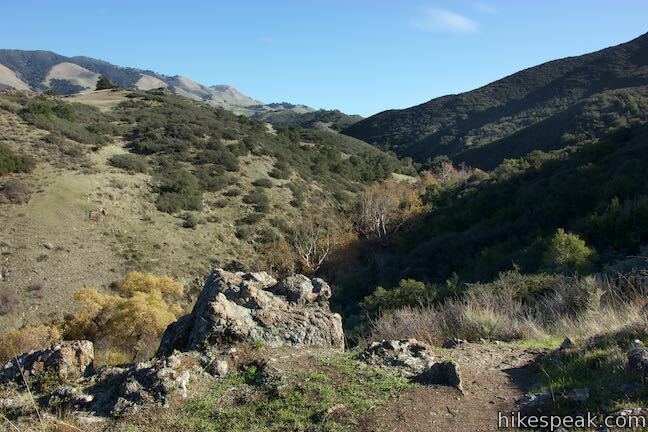 Reservoir Canyon Trail and Summit Trail deliver great half-day hikes. 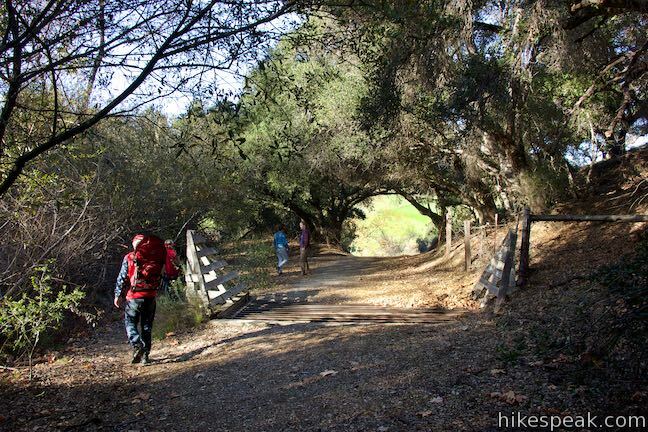 However, a shorter option exists that packs Reservoir Canyon into a one-mile experience with 150 feet of elevation change. 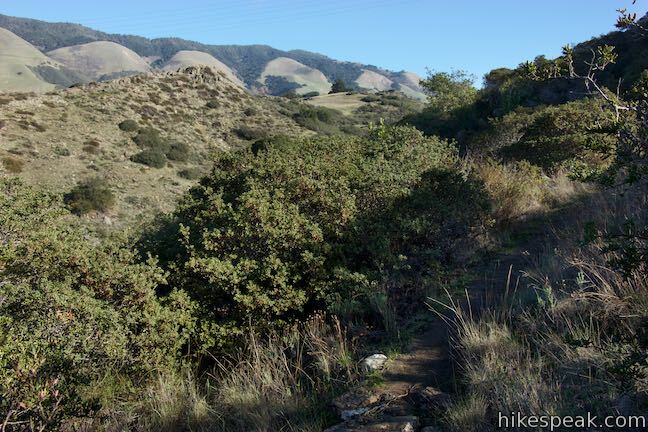 Use Creek Bypass Trail to tie the bottoms of Summit Trail and Reservoir Canyon Trail together, gaining views over riparian Reservoir Canyon, cradled below the Santa Lucia Mountain. 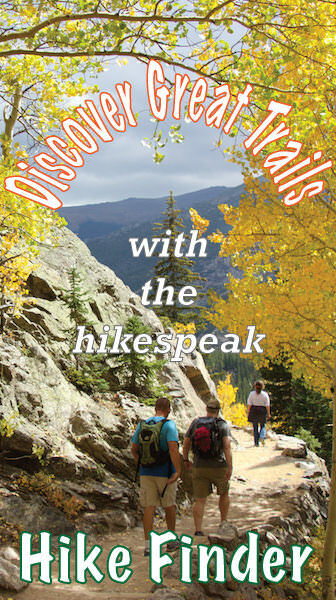 Reservoir Creek Falls is a minute up the trail, so get going! 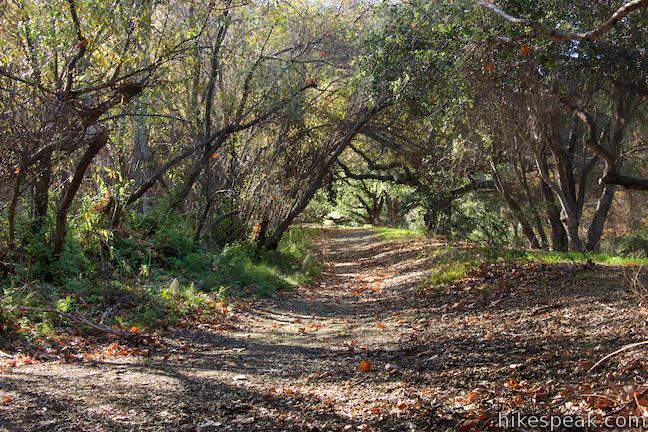 As its name suggests, Creek Bypass Trail also serves as an alternate route for the bottom of Reservoir Canyon Trail, which can get wet and muddy when Reservoir Creek is flush. 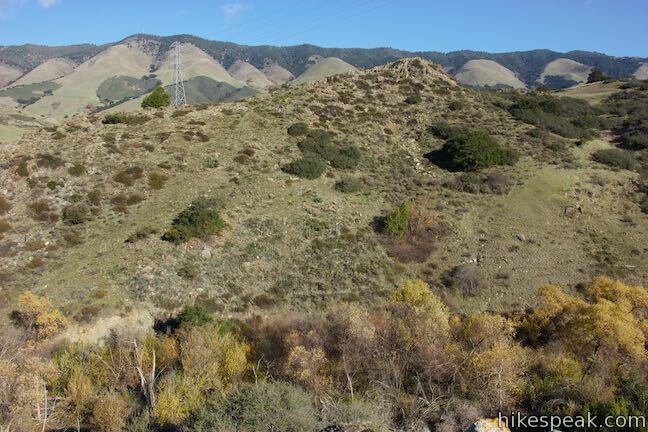 During stretches of winter wetness, Creek Bypass Trail becomes the recommended replacement from Reservoir Canyon Trail and this loop stops being an option. 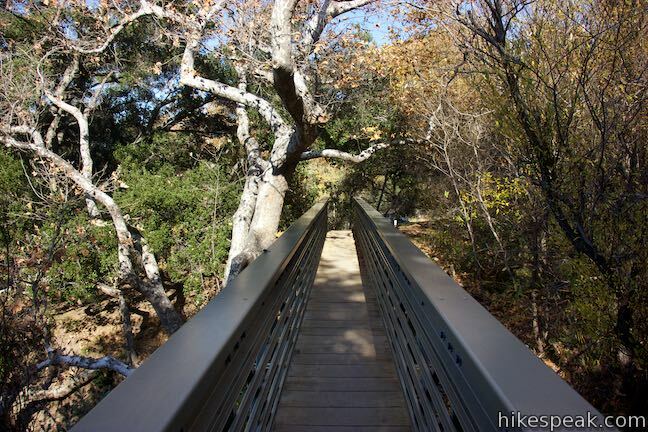 If you’re a self-disciplined hiker, you could save Reservoir Creek Falls for the end of this hike and travel clockwise up Reservoir Canyon Trail, across Creek Bypass Trail, and down Summit Trail to the waterfall and trailhead. The directions provided here take the opposite approach, immediately indulging in Reservoir Creek Falls, and then crossing Creek Bypass Trail toward Reservoir Canyon Trail, in the directions that seems to maximize the trail’s views for hikers. 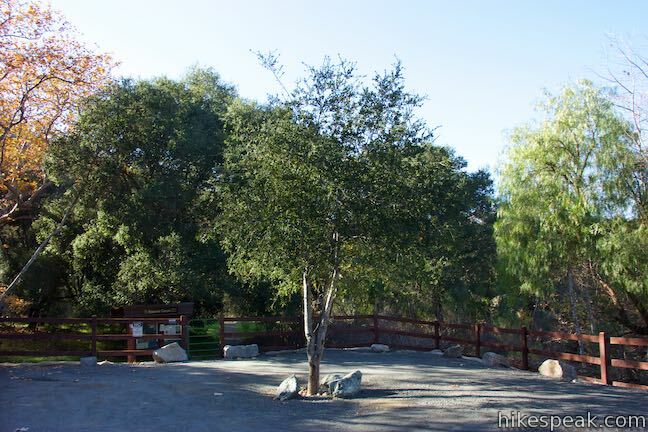 Make your way to the large (new) parking area at the Reservoir Canyon Road Trailhead. 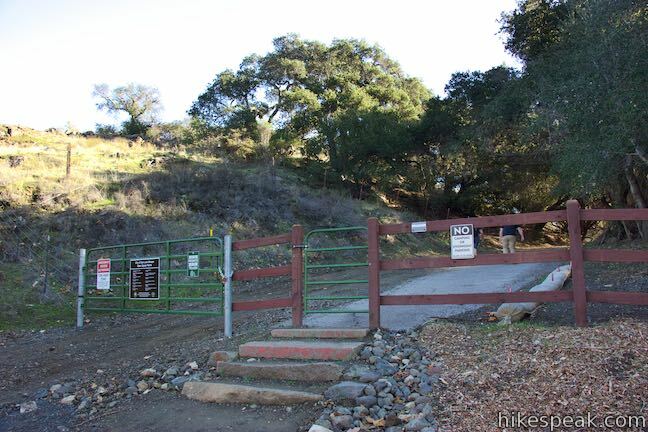 At the east side of the parking area, and a straight shot off the end of the road, is a gate at the beginning of Reservoir Canyon Trail. Use this trail to finish the loop. Begin instead beside the kiosk at the west end of the parking area. Walk through grasses into the woods beside Reservoir Creek. Rising in front of you is Reservoir Creek Falls, measuring some fifteen or twenty feet tall. 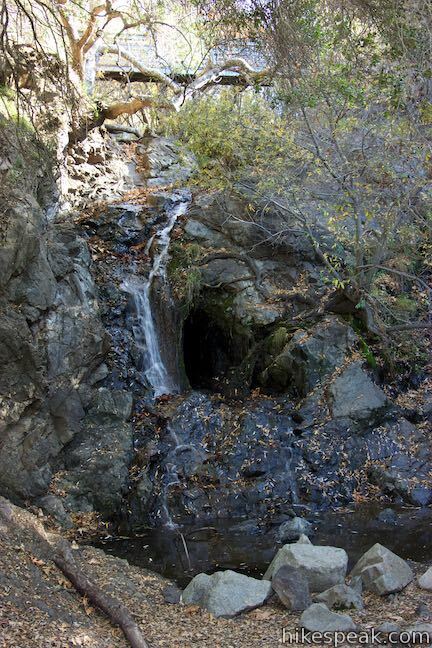 The charming waterfall slides down a slope of black rock into a shallow oak-shaded pool. 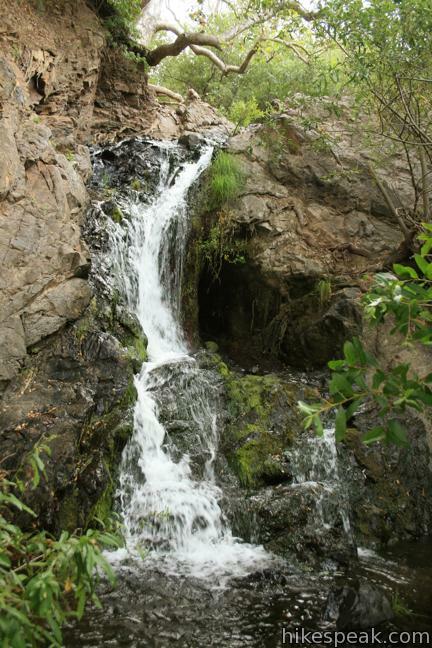 This waterfall nearly disappears during dry months, but is plenty enjoyable when water is flowing. 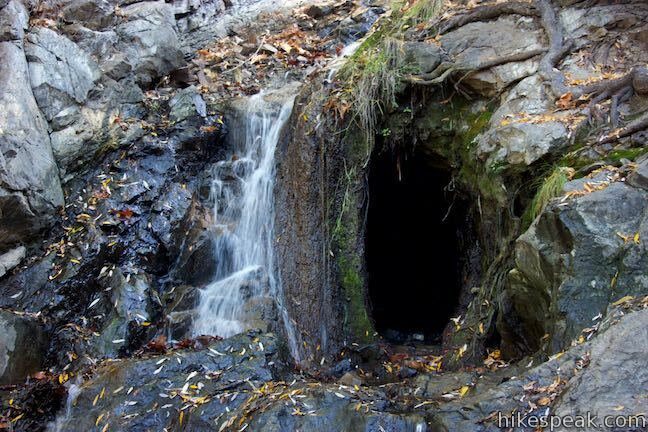 A tunnel on the right side of the waterfall is a remnant of the old reservoir in the canyon. 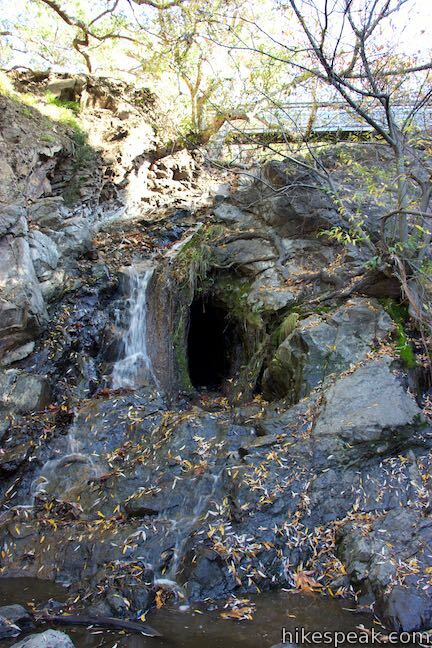 The tunnel served as an outflow for the dam. From the waterfall, proceed up the slope on the left side of the falls. Rise to a junction and turn right onto a bridge that spans Reservoir Creek above the falls. 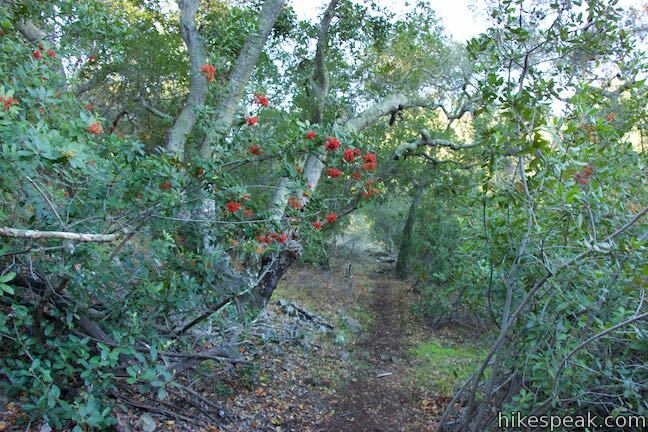 Cross the bridge and follow Summit Trail through dense oaks and toyon on the opposite bank. 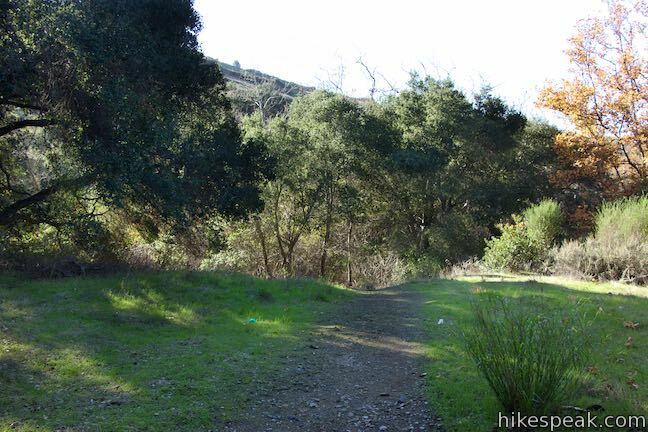 This nicely established single track rises up the side of Reservoir Canyon through a few turns and switchbacks. 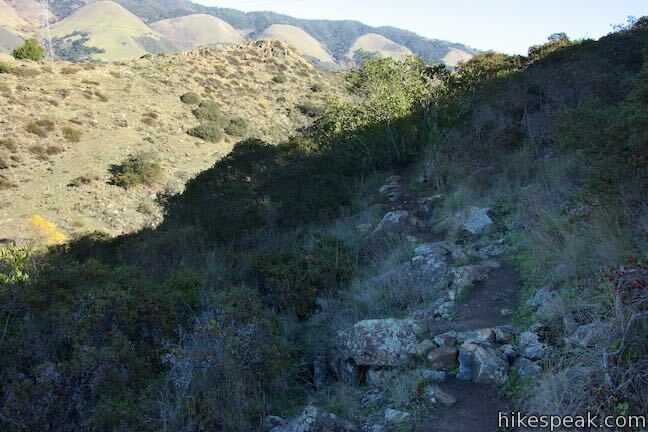 Follow Summit Trail for 0.2 miles up to Creek Bypass Trail. Don’t get fooled by another path parting to the left, 150 yards up the trail, which is barricaded off and is not the trail you seek. At the next switchback to the left, avoid a small path on the right (this may be a junction for future trail development). Rise through more live oaks to the marked junction. Stop climbing up Summit Trail, toward the tower on the ridge above, and turn left onto Creek Bypass Trail. 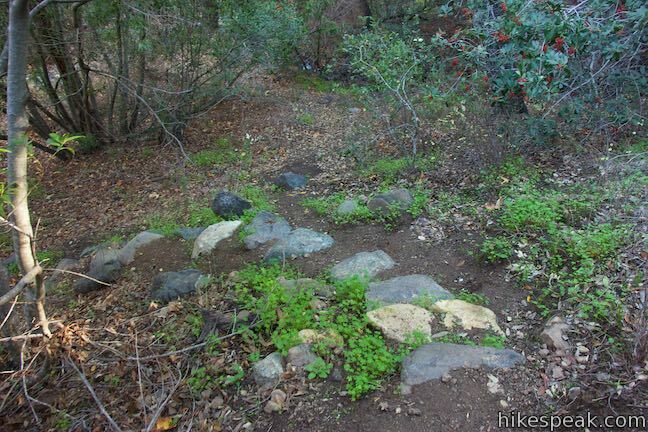 Creek Bypass Trail levels out and crosses a slope covered in grasses and low brush. 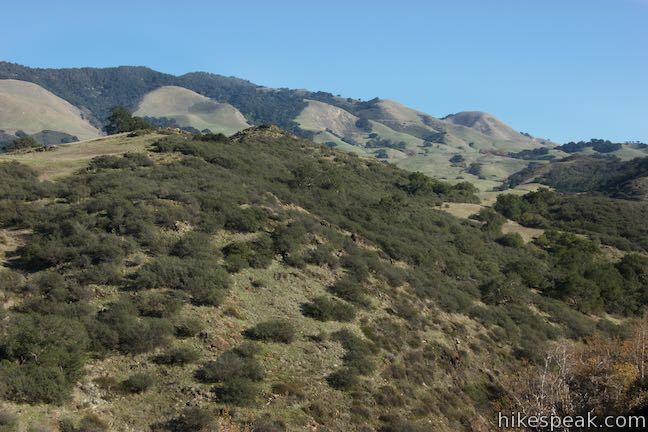 The vegetation presents open views north toward the Santa Lucia Mountains (where hikes on West Cuesta and East Cuesta depart from the Highway 101. 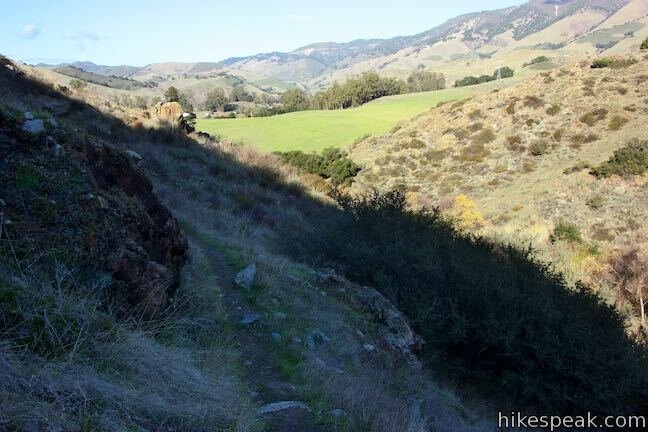 After about 100 yards on Creek Bypass Trail, and 0.3 miles from the trailhead, put the hiking on pause as the trail curves to the right atop a bend in Reservoir Canyon. 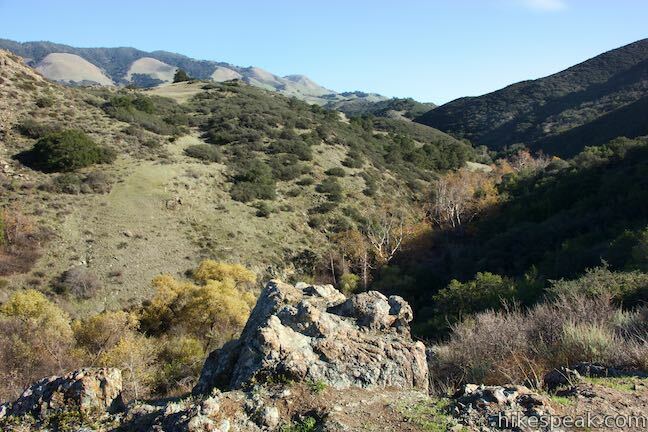 Stop beside a rock outcropping and absorb a sweeping perspective over Reservoir Canyon. Look out from the viewpoint over the trees growing along the bottom of the canyon. 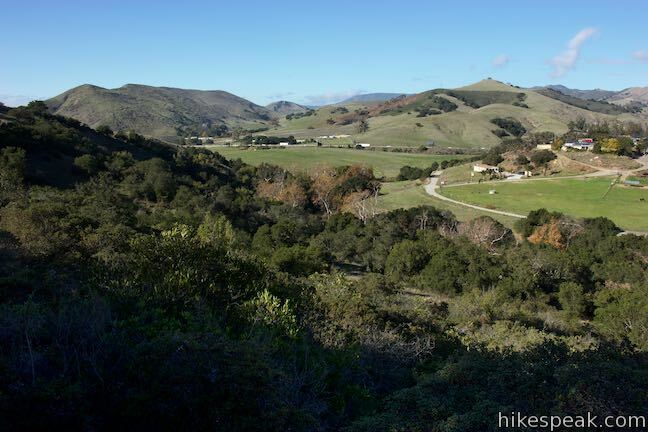 Grass and chaparral-covered slopes frame the canyon, rising into the mountains north of San Luis Obispo. 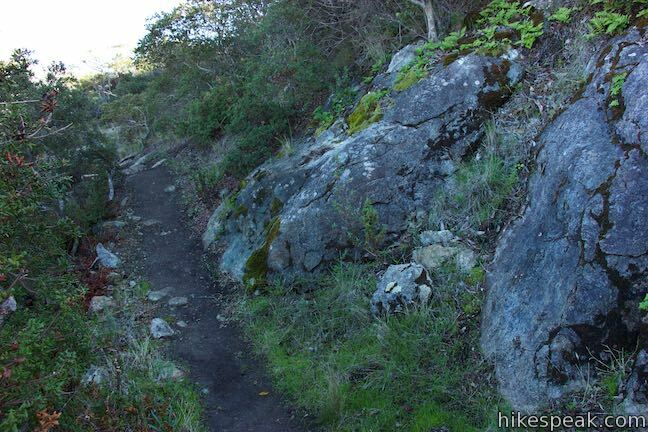 Continue along Creek Bypass Trail, which crosses below cliffs of exposed rock on the wall of the canyon. Cross a gully where a drainage flows down the side of the canyon. 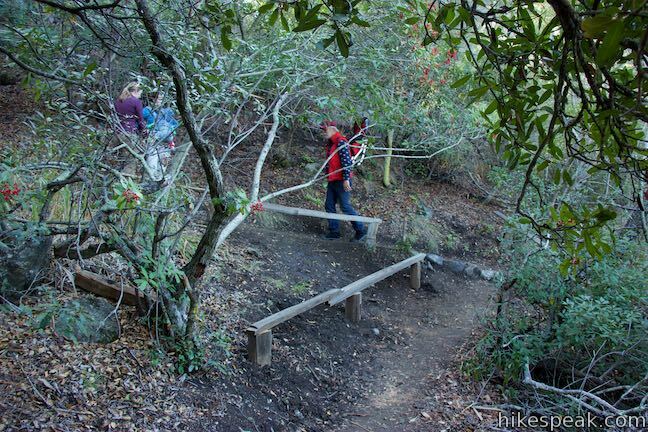 When an unmarked path descends to the left, continue straight along the main trail. 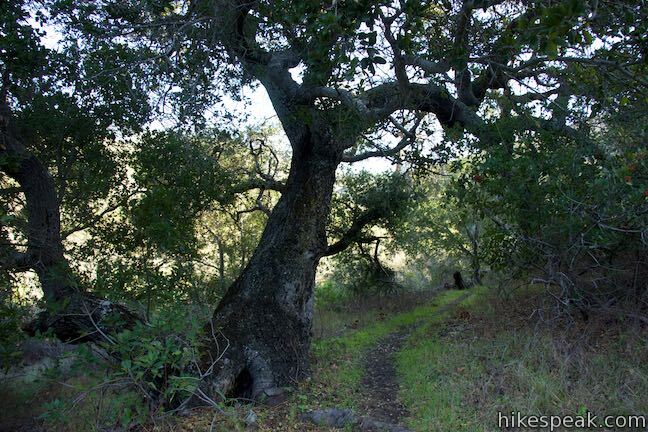 Oaks appear beside the trail, ushering you down into the canyon. 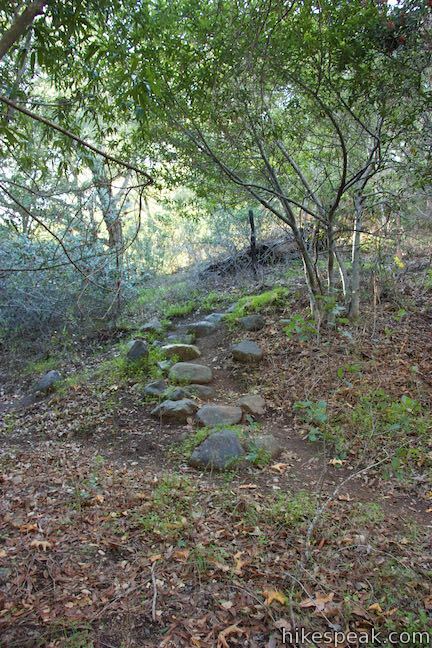 Return to the shade, arriving at stone steps that swing down to the canyon bottom. 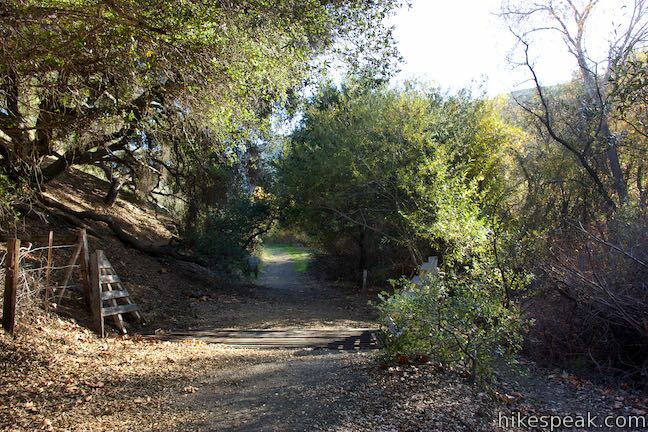 Cross the creekbed to a T-junction with Reservoir Canyon Trail. 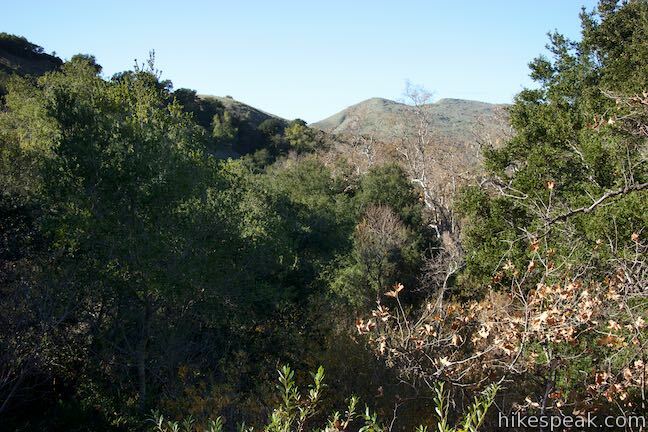 To the right, Reservoir Canyon Trail pushes farther up the canyon to the ridge above. 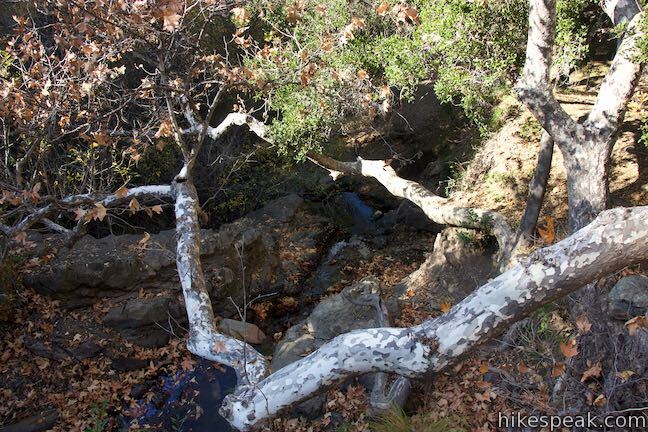 If you are using Creek Bypass Trail to bypass wet areas lower in the canyon, bear right and venture up the canyon. 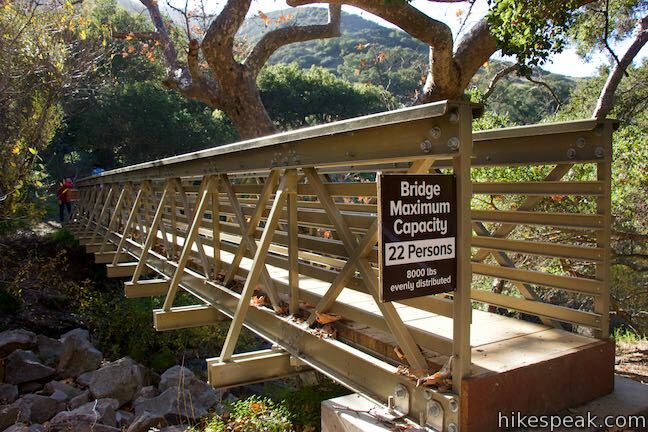 For the 1-mile loop, turn left down Reservoir Canyon Trail. 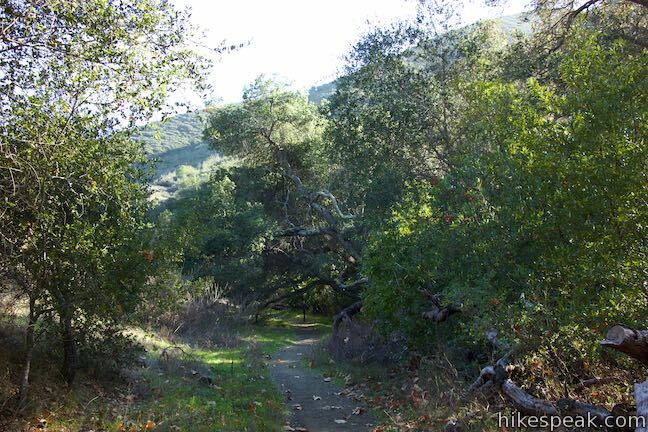 Reservoir Canyon Trail passes between the trees sheltered along the creek and the grassy slope on the side of canyon. The trail is wide, but narrows in places where it twists through crossings of Reservoir Creek (where the trail can get washed out after rainstorms). 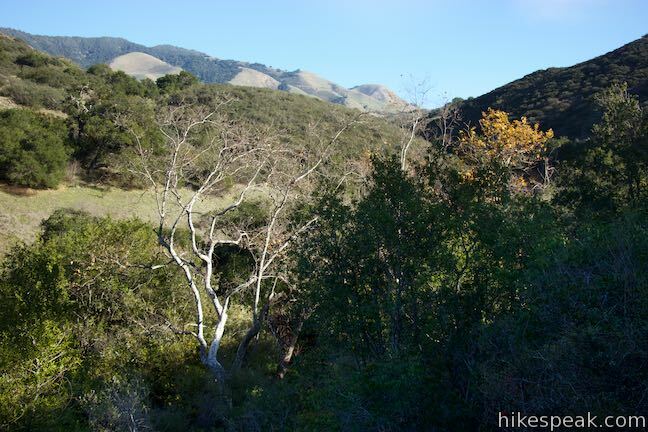 The level trail slips through the shade of sycamores, oaks, and assorted brush. 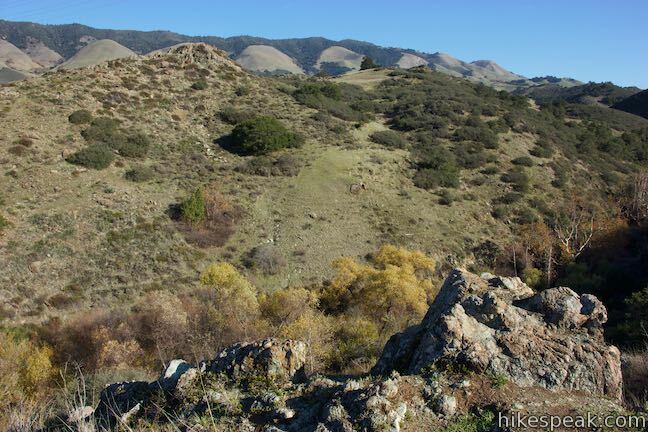 Reservoir Canyon Trail widens into an old municipal road, a remnant from the canyon’s former purpose as a reservoir for San Luis Obispo. 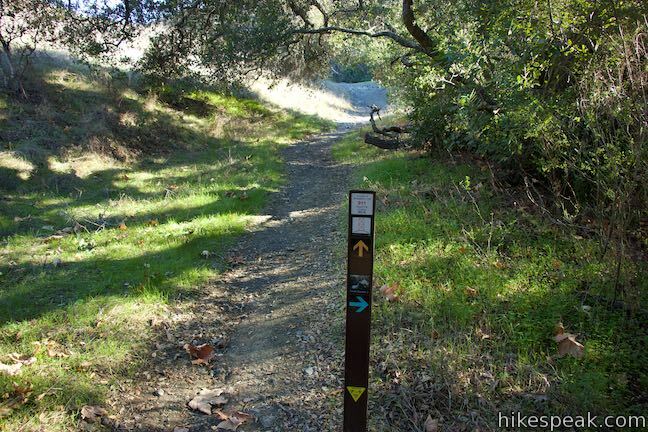 Just before the trailhead comes into view, cross a junction with a trail parting to the left. By turning here, you would quickly reach the bridge across the creek for Summit Trail and the route down to Reservoir Creek Falls. Unless you’re compelled to see the waterfall again, simply walk straight through this last junction. 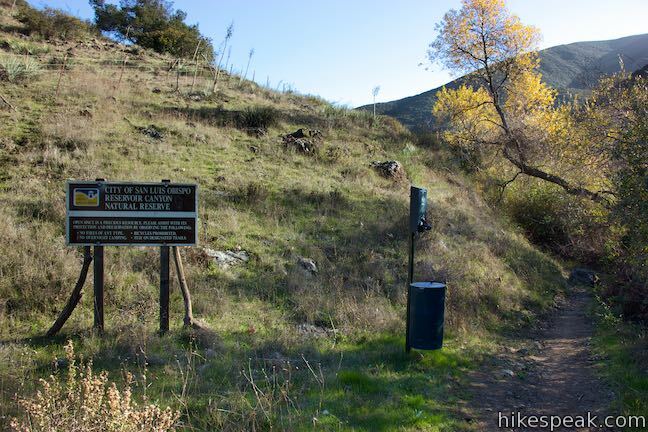 The trail ends at the east side of the parking area where you began, completing the 1-mile loop on Summit Trail, Creek Bypass Trail, and Reservoir Canyon Trail. 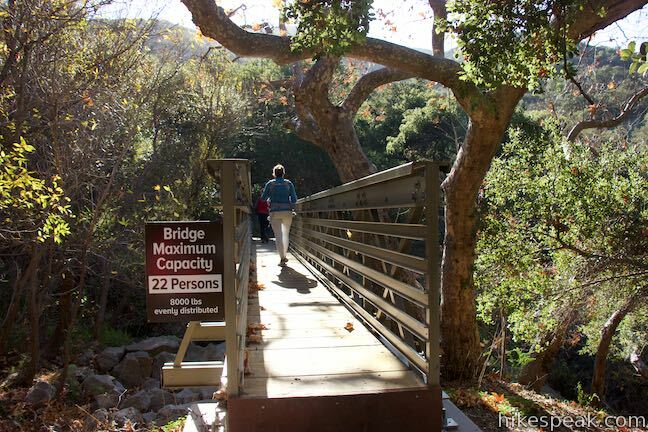 No fee is charged to park at the Reservoir Canyon Road Trailhead and no permit is needed to hike in Reservoir Canyon Natural Reserve. Dogs are welcome on leashes but bikes are not permitted. 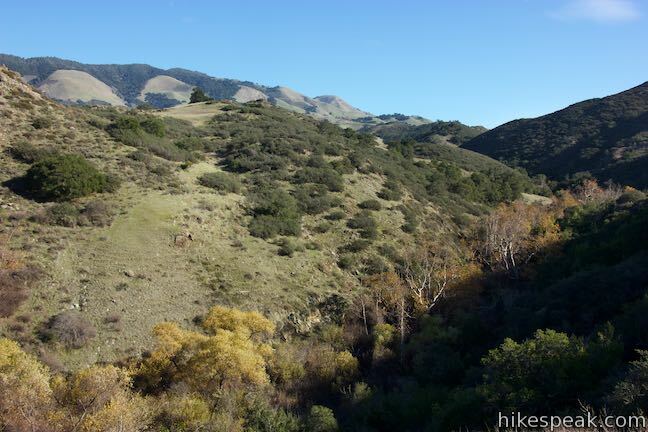 Reservoir Canyon Natural Reserve (formerly Bowden Ranch & Reservoir Canyon Open Space) preserves 783 acres. 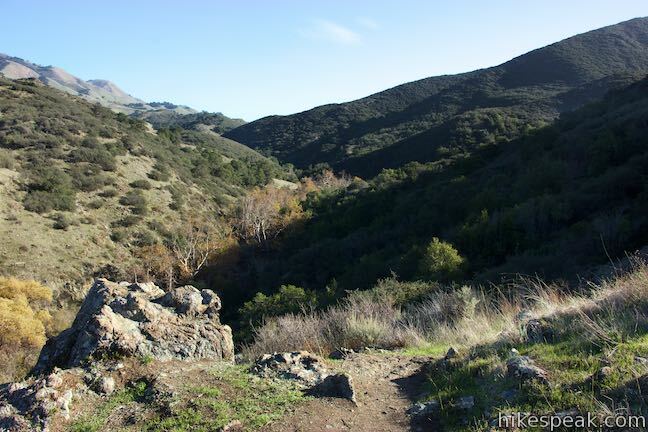 To spend more time in this city of San Luis Obispo reserve, explore Reservoir Canyon Loop. 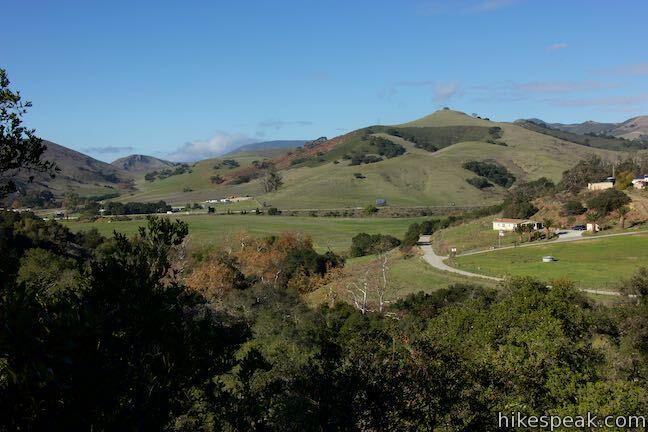 To get to the trailhead: From downtown San Luis Obispo, take Highway 101 north for approximately two miles to Reservoir Canyon Road (an easy-to-miss road connecting to the freeway). 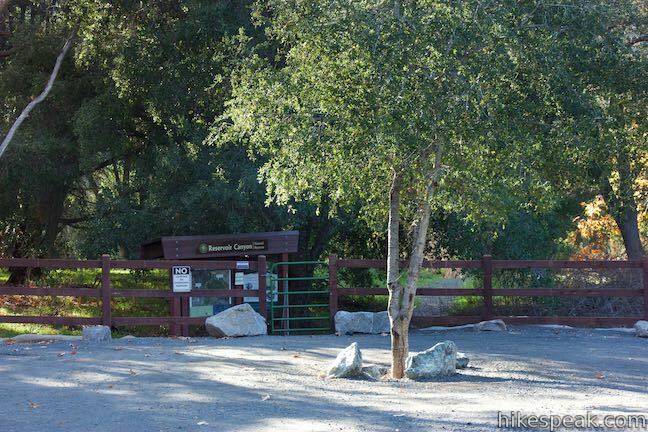 Turn right and drive half a mile to the trailhead parking area at road’s end. After the hike, exercise caution when getting back on the highway. It may be safer to drive north and turn around at another exit rather than cutting across northbound traffic to reach the southbound lanes to San Luis Obispo. 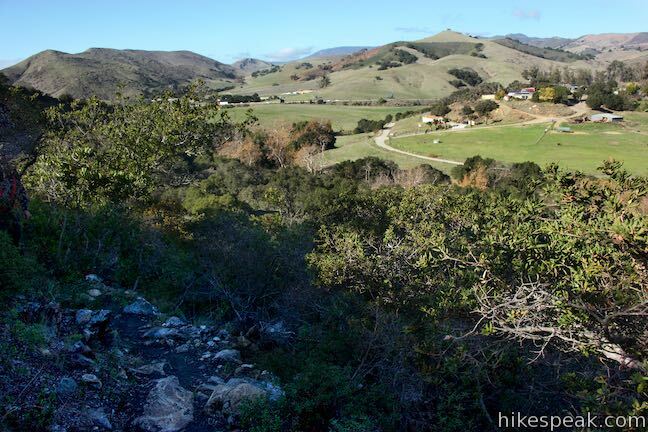 This 4.1-mile hike ascends to a point on the northwest end of the ridge above Reservoir Canyon, presenting panoramic views over San Luis Obispo from the base of an old tower with a bell that can be rung with a thrown pebble. 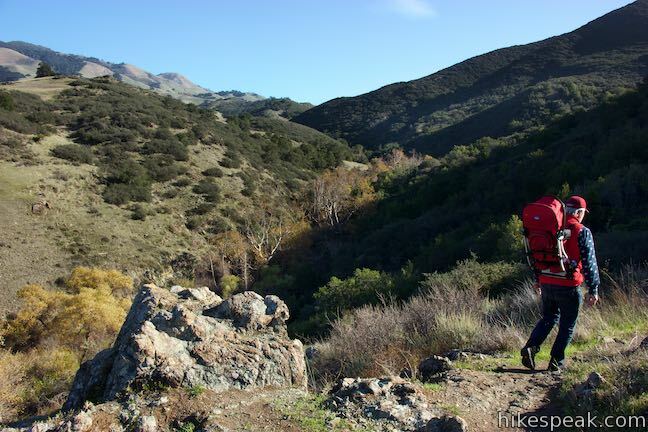 This 5.6-mile loop ventures up Reservoir Canyon Trail to the summit viewpoint, crosses Ridge Trail to the bell tower, and descends Summit Trail back into Reservoir Canyon. 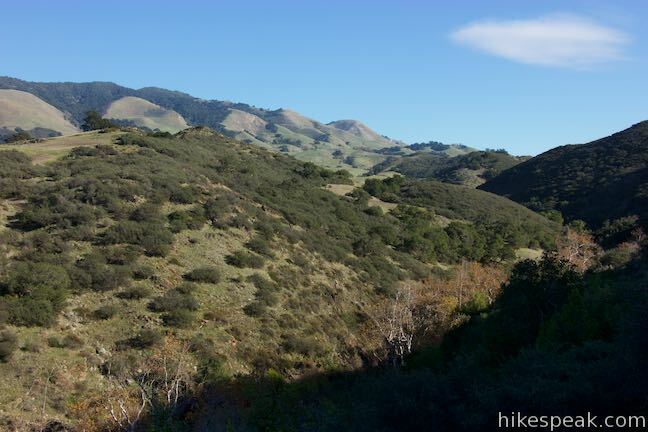 This 4-mile hike summits one of the Nine Sisters just west of downtown San Luis Obispo. 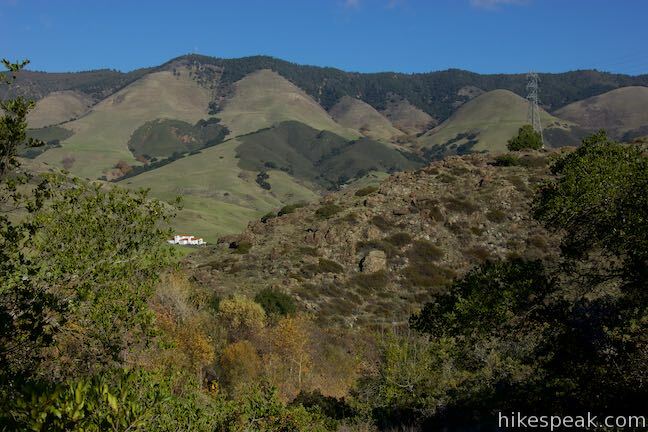 This 5.7-mile hike reaches the summit from a nearby park. 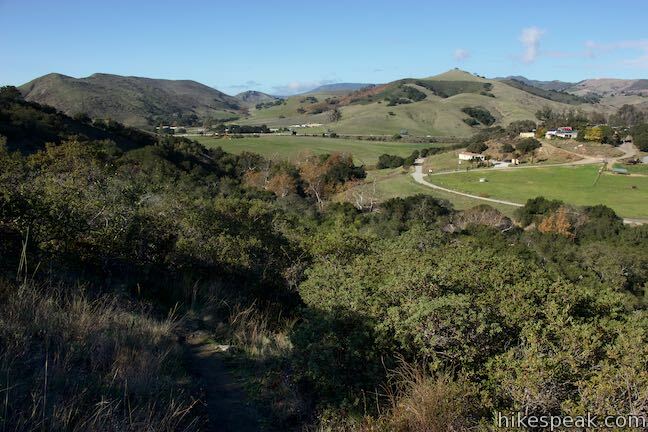 Explore other trails around San Luis Obispo including Morro Bay State Park, Montaña de Oro, and the Morros. This place is beautiful. It’s amazing. The waterfalls were awesome. Especially after a rainfall. The trails are fairly easy, we had only tennis shoes on and we were fine. A one of a kind place. Bring your own drinks it can get warm and dry.